Int J Oncol, 2017, 50(1):101-110. BIO purchased from Selleck. Lysates of HCT116p53KO cells were harvested 24 hs after treatment with different GSK3 inhibitors and GSK3A/B activation/inactivation checked by western blot: a mix of pSer21-GSK3A and pSer9-GSK3B antibodies and antibody cross-reacting with both pTyr279-GSK3A and pTyr216-GSK3B were used to assess the specificity of the inhibitor for GSK3A. BIO: 6-bromoindirubin-3'-oxime, TWS: TWS119, SB2: SB216763, SB4: SB415286. PLoS One 2014 9(7), e100947. BIO purchased from Selleck. The first pharmacological agent shown to maintain self-renewal in human and mouse embryonic stem cells. Kinase activities are assayed in Buffer A or C at 30°C, at a final ATP concentration of 15 μM. Blank values are subtracted and activities calculated as pmoles of phosphate incorporated during a 10 min incubation. Controls are performed with appropriate dilutions of dimethylsulfoxide. In a few cases phosphorylation of the substrate is assessed by autoradiography after SDS-PAGE. GSK-3α/β is purified from porcine brain by affinity chromatography on immobilized axin. It is assayed, following a 1/100 dilution in 1 mg BSA/ml 10 mM DTT, with 5 μl 40 μM GS-1 peptide, a specific GSK-3 substrate, (YRRAAVPPSPSLSRHSSPHQSpEDEEE), in buffer A, in the presence of 15 μM [γ-32P] ATP (3,000 Ci/mmol; 1 mCi/ml) in a final volume of 30 μl. After 30 min incubation at 30°C, 25 μl aliquots of supernatant are spotted onto 2.5 × 3 cm pieces of Whatman P81 phosphocellulose paper, and 20 seconds later, the filters are washed five times (for at least 5 min each time) in a solution of 10 ml phosphoric acid/liter of water. The wet filters are counted in the presence of 1 ml ACS scintillation fluid. Method: COS1, Hepa (wild-type, CEM/LM AhR deficient and ELB1 ARNT deficient), or SH-SY5Y cells are grown in 6 cm culture dishes in Dulbecco's Modified Medium (DMEM) containing 10% fetal bovine serum. For treatment, IO (5 μM), BIO (5 or 10 μM), MeBIO (5 or 50 μM), LiCl (20 or 40 mM), or mock solution (DMSO, 0.5% final concentration) is added to medium when cell density reaches ∼70% confluence. After 12 (SH-SY5Y) or 24 hours, the cells, while still in plate, are lysed with lysis buffer (1% SDS, 1 mM sodium orthovanadate, 10 mM Tris [pH 7.4]). The lysate is passed several times through a 26G needle, centrifuged at 10,000 × g for 5 min, and adjusted to equal protein concentration. About 8 μg of each sample is loaded for immunoblotting. Enhanced chemiluminescence is used for detection. 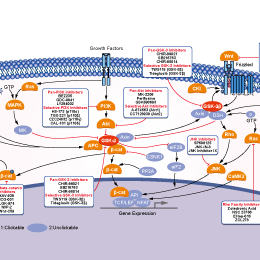 The following primary antibodies are used: mouse anti-β-catenin CT (Upstate Biotechnolgies, Clone 7D8, recognizes total β-catenin), mouse anti-phospho-β-catenin (Upstate Biotechnologies, Clone 8E7, recognizes dephosphorylated β-catenin), mouse anti-GSK-3 β, mouse anti-GSK-3 phosphoTyr216, rabbit anti-AhR (Aryl hydrocarbon receptor), and rabbit anti-actin. Formulation: freshly prepared in 30% Solutol (Basf) at a concentration of 10 mg/mL. Meijer L, et al. Chem Biol, 2003, 10(12), 1255-1266. Sato N, et al. Nat Med, 2004, 10(1), 55-63. Tseng AS, et al. Chem Biol, 2006, 13(9), 957-963. Liu L, et al. Cancer Res. 2011 Jun 1;71(11):3972-3279.